While Columbia Pictures is doing their best to convince audiences to see Andrew Garfield slinging webs in The Amazing Spider-Man, we're hoping that every single bit of footage from the film doesn't end up online via trailers and clips. Now, normally we don't post out of context clips from the film, because we think that's a little too much, but trailers, both domestic and international, and TV spots are just fine by us. And there's some fun new high school footage and more in this one-minute TV spot for Marc Webb's comic book franchise reboot along with some stuff from that epic third trailer from not too long ago. Watch it! Meh. I'll wait for the Blu ray and then I'll rent it. With a coupon for a free rental. A "rent one- get one coupon. I was hoping you were going to do a frame by frame comparison of Spider-Man 1 to the Amazing Spider Man. The Raimi Trilogy was good with 1 being the best,but why not give a new movie a chance rather than go into it hating it. expressing your opinion in mehs rather than elaborating. All I said was I was going to rent it. Maybe I like renting movies. Did ya ever think of that? DID YA? Yep. Direct to DVD5. I'm in. WOW! A made for tv Spider-Man movie! When does it air? haha actually looks like one thats for sure. Any real Spider-Man fan would actually know that the premise of this movie follows the comics way more than the previous trilogy did. They aren't making it "grim" or "dark", just following roots. And combining elements from both the original 60's comics (such as Lizard's original design) and the Ultimate Spider-Man series (such as Peter Parker being modernized, and having his father being a big time scientist and that whole story line). I loved the first series, but honestly it's been 5 years since the last Spider-Man movie came out, Toby called it quits along with Raimi, it was just time to start anew. This film has a phenomenal cast working for it, and a unique perspective of Spider-Man that hasn't been on screen before. So every chill and quit bashing without knowing all the details. I'll be there opening day. I'm with you Afro! This movie is going to be great and all of the haters who don't know what they are talking about need to relax! How do you "pretty much" get fired? I don't answer dumb questions sorry. Growing number of trolls on this site lately..
You just make dumb statements? Anything else you want to add Mr. Critic? But one more thing Cochise. If I had said that this new Spider-Man movie looked great from the trailers and stills, I doubt I would have gotten a response from you or those other ladies. But since I said I don't think it looks that great I get all your tears. Why is it that it's okay to form a positive opinion from the trailers, but not a negative one? Is it because you agree with the positive ones? Are you even aware of your incredible hypocrisy? Warning : This is most dangerous spidy " Lizard Eat The Spiders "
Actually this is based off of 1! ONE! issue and ultimates, ultimates being the worst thing Marvel ever did. So NO! this is not closer to spider man. This is the SONY SPIDER! and thats it. Not entirely convinced that's true. Pretty sure all the stuff going on and on about Parker's parents comes much later than the original origin story. It's classic Marvel to overcomplicate things later on in the existence of a character. Also, the ultimate universe? Really? We've actually exhausted 50 years of decent comics that we're using that c**p? i agree afro!! i soo can not wait for this movie, my bday is june 22nd and i'll be 23 but idgaf about my bday im looking forward to july 3rd! Yeah and morons gonna point out the obvious! WHY, why, why are there so many haters out their. I can't believe that you all judge a movie before it is even out! YOU CAN"T JUDGE A MOVIE BASED ON A TRAILER, with unfinished CGI. Especially when it is being created by a proven director and has had some fantastic marketing. Every part of which has shown that this is going in a great direction. You guys are lame! In the words of Po: "I'm freaking in!" I just hope they didn't blow their load too soon with that money shot at the end. 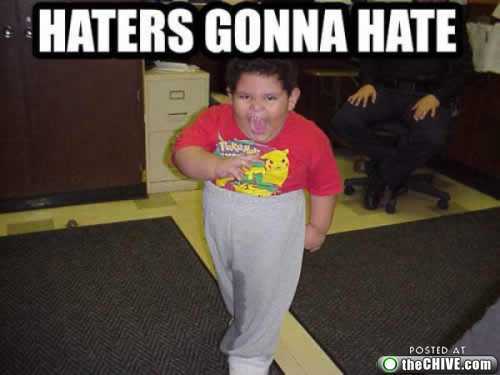 If haters gonna hate... masters gonna..? For me, this was the perfect trailer. Not too long. Showed just enough without giving too much of the best stuff away. I think it'll be a fun movie to say the least. I am not hyped at all. The CGI looks amatuer commercial grade quality. How many times do we need to see the ORIGIN of the same comic book characters?? This stuff could more effectively be done with flashbacks at certain stages during the movie. But nope. Looks like we get to see him go back to highschool and get into a foodfight and get another spidey bite... So boring. Will this be better then Spidey 3??? Well I am pretty sure it will be because of how awful that one was. But that isnt really saying much about this one either. Sam Raimi did a great job with the Spidey franchise. Remember it was the studio that wanted to stuff all the Venom nonsense into the film, resulting in a half told story that wasn't fleshed out enough. Two major villains in a film is ALWAYS a bad idea. (The reason it worked in TDK is because Harvey wasn't a villain for most of the film.) Spider-Man 1 was great, and Spider-Man 2 is a classic, but 3 was a mess. This new one just doesn't interest me. Pete just has too much "angst" he's going to be crying and moaning about how bad he has it the whole movie. I for one couldn't care less what happened to his parents. I also wish they had not made this another origin story. And for "Pete's sake, I wish they would quit showing that "Small knives" clip! It's not any more humerous the 500th time. Wow talk about living in a bubble... The Sam Raimi vision was a mess from the start and nobody liked Tobey because he came off as a whiner with that horrible screaming he has. Andrew Garfield looks like the true depiction of spiderman/Peter Parker who looks as if he will get something done using his scientific mind instead of finding cool ways to shoot webs out of his wrist and whining about how he can't get his way through life like Tobey did. Andrew looks headstrong, focused and has the acrobatic body type like spiderman does. I'll admit Sam redeemed himself with spider-man 2 but the only thing he stayed true to the comics was with the costume. It's called a reboot for a reason because this time around they are staying true to the comic book origin of spiderman and stop nitpicking at the trailer because of one scene. I think that particulary scene speaks volumes of the type of spider-man we are dealing with. Wow. You sure love Andrew Garfield as Spider-Man don't you? Maybe he'll be good who knows? I hope so. But to trash the Sam Raimi Spideys is asinine. They seemed to do REALLY well at the time. Both Spider-Man and Spider-Man 2 are in the top twenty of All Time Box Office. I guess no one noticed what a mess they were from the start huh? There is a long line of people joining the list of Sam Raimi's spiderman haters....and Andrew Garfield seems like a better actor than Tobey sorry if that hurts your ego. Go back into your cave little troll and do something more constructive with yourself than bashing little things that don't matter. I've bashed you a couple times. Is that what you mean? Wow you are still talking? I'm clearly talking about movies and you are making personal attacks...Get a life troll i'm done feeding you. Blade Runner did horrible at the box office but now is considered a sci-fi classic and a masterpiece. Batman and Robin was a box office hit and now it's still being hailed for destroying the batman franchise. So yeah the box office smash hits doesn't really say much about the quality of a film. People don't continue to go see films that are really bad. Word of mouth plays a big part in a movies box office success. Batman and Robin made all of it's money early then dropped off REALLY fast. That's why they track box office drop off percentages from week to week. Films that make big money don't drop very much each week. Look at all the top grossing films and look at their weekly earnings and you will understand. Boxofficemojo.com is a helpful website to help you know more about it. And knowing is half the battle! Blade Runner has built up a cult following over the years. It just came out at the wrong time. A lot of movies have become more popular after they leave the theater. A film simply does not make $400 million dollars if people don't like it. It just doesn't happen. You have given no credible reason why the Sam Raimi films were not any good other than your own bad taste. I thoroughly enjoyed Sam Raimi's Spidey 1 and 2, but I would have to say that while Tobey McGuire was a great Peter Parker, judging by the trailers Garfield will be the better Spidey. How he fares at Peter Parker remains to be seen for now. I am so glad they made him a snarky, sarcastic smartass when wearing the costume. That was one of the character's main attributes that I loved as a child watching the cartoons and reading the comics, and it was the one thing Raimi's Spider-Man was lacking. And when exactly did you take your poll of everyone in the world to declare that "nobody" liked Toby McGuire? Pretty big assumption chief. If he was any good the studio would of kept him as Spiderman obviously people are getting tired of him. Yeah, that's probably it. Because it took 3 films and a billion dollars for the studio to decide he wasn't any good as spider-Man. Spider-Man and Spider-Man 2. Both in the top twenty of the highest grossing films of all time. Just my luck I have to debate with people that weren't even old enough to buy a ticket by themselves back in 2002. For a guy who proclaims himself to be a fan of Tobey it sure is sad that you spell his name wrong all the time. It's Tobey Maguire, sir. Way to come in late.